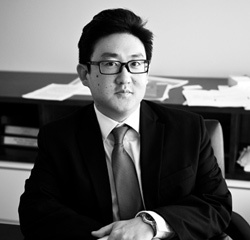 Dr. Irwin Park is a Partner in the Chicago office, having joined Global IP in September 2013. Dr. Park is involved with all aspects of patent monetization, including assessing infringement, drafting agreements, and drafting patent claims. He is well-versed in a variety of technologies, ranging from wireless communications to biotechnology. Dr. Park received his JD from DePaul University College of Law in 2013, where he was the Legislative Updates editor for the DePaul Journal of Art, Technology, and Intellectual Property Law during the 2012-2013 school year. Prior to entering law school, he earned his B.A. from the University of Chicago in 1999 in the Biological Sciences, and earned his Ph.D from Northwestern University in 2009 in Cell and Molecular Biology. Dr. Park is registered to practice before the United States Patent & Trademark Office, and is licensed to practice in the state of Illinois.